Since you all asked for more, here’s another minute-long process video that I shot a few days ago. 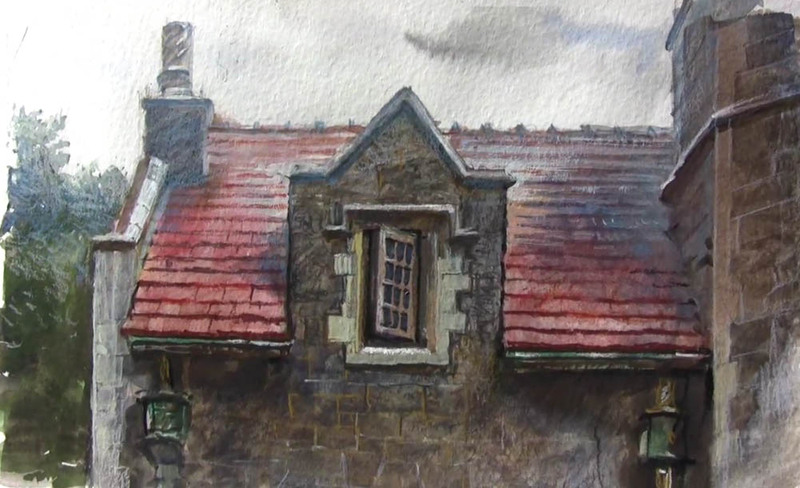 (Video link) The subject is the Ward Manor gatehouse at Bard College in New York. The basic procedure is to paint softly and loosely with a big brush in the early stages and then switch to smaller brushes and colored pencils for the smaller details. There's a little bit of gouache for highlights and corrections. Here are the tools I used:Schmincke Watercolor Pocket Set , 1-inch flat watercolor brush , Caran D'Ache watercolor pencils , Moleskine Watercolor Notebook , and a 1/4 inch flat watercolor travel brush (don't know brand). Either way - thanks -It's very inspiring and great to see in action! Do you water out the water soluble colourpencils or do you just leave them as they are? Yes!! I had been wanting more process videos from you. Great work, sir. This was actually extremely helpful. Thank you so SO much for sharing. I have always wanted to try and paint faster and now realizing I am just not really using the right process. I have always tried to stick with no pencil, and just had the realization here now that sometimes it is the way to go when traveling or simply want to do some quick study, to capture the moments before they go away. I am going to invest in some watercolor pencil for sure now. You think any brand would work just as well? I mean I do have some cheap no name brand packs from no where..I will try those out first. Thanks again!! Great. I have to say, maybe Loomis wasn't so right when he said that it's not useful to watch someone else paint. I learned something: when they say big brushes, they really mean BIG! Was the paper damp when you added the colored pencil? Robb and Sir Brian: -- Thanks. Glad you enjoy this short form. I'll eventually have videos for sale, but I'm still playing and experimenting. The super-short form is a fun challenge. Also, I've noticed that for videos in iBooks for the iPad, the one minute length is ideal. ZS. I usually water out the colored pencils, but this time I just used them for finishing details and small touches that were tedious to do with a brush. Carolyn, I almost always put the pencils down on dry paper. If it's wet, they deliver a darker and more indelible line. Elaine. Watercolor is all about tight vs. loose. I like a fairly tight drawing, a loose lay-in and sky, and then tight final details. For the pencils, I'd say buy one of each brand and see what you like. My favorites are the Caran d'Ache brand. Emanuele, thanks, and you raise an interesting thought. I'm aware of how Pyle and other teachers avoided talking about technique, but they had the advantage of students who went through lots of practical training first. I'm someone who never watched an artist paint until art school, and even then most teachers didn't demo. There are many ways to work--mine definitely isn't THE way, but I love watching how other artists crack the egg and make the omelet. I have an unreasonable fear, bordering on a phobia (!) of laying down broad strokes of color, and I actually held my breath during that part of your video. Relieved to see that it turned out so well. I always learn something here, and have started my own index of posts for further instruction. This one will be added to it. Thank you! Another fascinating video. You sure do pack a lot into 1-minute, and I understand the attraction of keeping these to that length for the reasons you mention, but I can't help but regret not seeing the bits we're missing. Now that is the proper brush size to image ratio for real painting. Great job! How much do you work wet into wet with watercolor? Obviously you mention doing big, wet washes at the beginning over damp paper, but later when you're working in tighter details before finishing it with pencils it appears to be wet over dry. Is that your general approach with these watercolor sketches, wet into wet early on to keep it loose general, then get more specific and tight with wet over dry applications? Wonderful little video Mr. Gurney! It's always fun to be reminded how you work. I just started trying to do some plein air paintings and I picked up a few tips from your video. Watercolor makes me a little nervous about losing my lightest values, so I'm very cautious where I put in my color. From your video, I learned that I should be a little bit more bold with my values. Thanks for the post! So you are basically scumbling with the white pencil? Did you use it for creating atmospheric perspective on the distant trees and chimney base? Did you hit it with more water or just put down a dry pencil hatch or "glaze"? Thanks for showing! I use watercolorpencils myself on regular basis for the details. I feel really comfortable with the use of them. Your painting is beautiful! Hi, I currently start painting on location with watercolor. However, I usually have trouble with highlight. Since I normally paint with acrylic, so I paint darker values first, then put the highlight on top, but this method doesn't work with watercolor. Can you give me some tips about how to do it with watercolor. Also, is it true for gouache too? I painted several paintings in gouache, and somehow I managed to put highlight on top as well, but not as successful as acrylic. Bravo! I just love seeing your videos. Very inspirational! Waited two days to watch this video - excellent, so different from what I do when I sketch. I cannot wait to try!! And then, of course I watched two more of your You Tube videos and now I am totally fired up!! (Wish it weren't bedtime - sigh). Janet, I know the feeling. I love watching other peoples' demo videos, and am amazed at the many ways of working. And I always learn something." Tom, there wasn't much more shot on this one, and if I had, it wouldn't have been pretty. Actually I've documented some other pictures more completely. Armand--I was thinking of Max Ginsburg's line: "Big artists use big brushes." Drew--answer, not enough. But yes, I do try to use wet into wet especially at the beginning. As with all types of painting, crisp hard edges are easy, and soft ones take the real effort. Ugly, I think I was a little more reckless than I was bold, actually, because if I was a bit more careful with placement, I wouldn't have needed to come back in with opaque white highlights. Daroo, yes, good eye. I scumbled dry and left it dry. Scumbling here was a late and not altogether ideal fix. It would have been better to keep the chimney and treetops light in the original washes. Thanks, Renate, Debra, and Patrick. HUY, in classic watercolor you have to paint around all the highlights or use a resist, and that's probably the best way to work. But you can always come in with opaque touches, too. In a sketchbook you can experiment. No risks. Dan, glad you enjoyed them. I just wanted to thank you for the video. It's extremely helpful seeing the process.